The University of Massachusetts Amherst is a research partner in Advanced Functional Fibers of America (AFFOA), a new $317 million public-private partnership announced today by U.S. Secretary of Defense Ash Carter. UMass Amherst is the only public university in New England participating in the MIT-led partnership, which includes 31 universities, 16 industry partners, 72 manufacturing entities and 26 startup incubators across 28 states. The partnership won a national competition for federal funding to create the nation’s eighth Manufacturing Innovation Institute. It is designed to accelerate innovation in high-tech, U.S.-based manufacturing involving fibers and textiles. UMass Amherst’s involvement in AFFOA draws on research expertise in its departments of polymer science and engineering, electrical and computer engineering and the College of Information and Computer Sciences. As part of the initiative, the university is committing up to $1 million in matching funds to support AFFOA projects, process development, and education and workforce training over the first five years of operation. 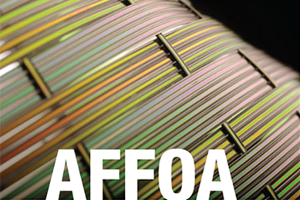 AFFOA is the second national Manufacturing Innovation Institute involving UMass Amherst. Last year, the university was chosen to be the lead institution in New England for the Department of Defense’s Flexible Hybrid Electronics Manufacturing Innovation Institute, a $75 million federal initiative to create a competitive, effective and sustainable research-to-manufacturing collaboration between U.S. industry and academia to solve problems in advanced manufacturing.